Do your pets try to talk to you? 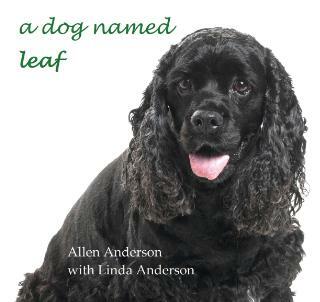 For many years, our cocker spaniel Leaf has vocalized to Linda in an attempt to talk to her every night before we all go to sleep. He jumps up on the bed, rolls over for a belly rub, and then begins with a series of moans and groans that are his version of words and sentences. Depending on how tough or interesting a day he’s had, he talks a lot or a little; in calm or excited tones. Linda asks him a question such as, “How was your day?” Leaf answers with emotional responses. Allen is also on the bed, watching the scene unfold. But Leaf doesn’t confide in him. He only shares his heart with his “mommy”. Allen’s role is to play with Leaf, so Linda calls him “Leaf’s favorite toy.” The dog is more than happy to have Allen scratching his ears during the debriefing session on bed at night. One night, Linda was amused to hear Leaf talking to her in his usual manner. Except for one thing: Leaf was having the conversation in a dream. From his dog bed next to ours, Leaf babbled on with the same kinds of moans and snorts he uses while awake. We will be signing our books at the following Kowalski’s Markets Twin Cities locations on SATURDAY, AUGUST 2, 2014. We look forward to seeing. More often than not, we receive stories from people who write about their pets after the beloved companion has died. Although these stories are wonderful tributes, we wonder if the person might have written while their pet was still alive. In the present moment we can express our gratitude for the joy they are bringing to our lives. When Allen wrote his memoir A DOG NAMED LEAF, it was emotionally fulfilling to be able to take a walk with Leaf, photograph him playing at his favorite dog park, and tuning in to who he is to us today. There is always a tinge of sadness in writing about animals, even while they are living. We know their life spans are shorter than ours. We know this immensely good thing will someday end. But writing and sharing stories about them, while we can still pet and play together, replaces fears of loss with admiration and gratitude for the blessings. Take a look, right NOW, at the pets in your life. What do you want to say about them? What are the touching, funny, confusing, remarkable things they do? What are the gifts they are bringing to you and your home every day? I recently did a radio interview and got to do what I love, which is to talk about my book, A DOG NAMED LEAF. I always enjoy sharing with anyone who will listen to me talk about Leaf and how we came out of challenging times as a spiritual team. Both of us became better and more loving from our experiences together. When have you asked your animal companion to go the extra mile and been rewarded with having your request filled? We enjoyed our time at the 4th Annual Dog Days of Stockholm as guest speakers. 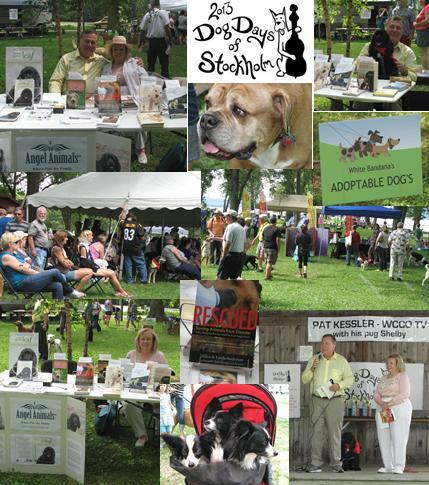 The daylong dog adoption event was well attended with many dog lovers traveling to the beautiful riverside village of Stockholm, Wisconsin. Booths with rescue groups and animal shelter volunteers and the dogs who needed homes lined the perimeter of the event. In addition there were pet related booths, dog demonstrations, stirring speakers, and a variety of activities such as a Blessing of the Animals by a local pastor and contests: Best Dressed, Best Trick, Looks Most Like Owner, Best Dog Name, and Best Dog Hairdo. Pat Kessler from WCCO TV in Minneapolis was the MC. He had a lot of help from his pug Shelby. Pat did an incredible job of keeping the program’s pace just right with his genuine love for dogs, great sense of humor, and spontaneity. Our little cocker spaniel Leaf was sweet and adorable. We gave him our “be nice” talk before arriving at the event. Leaf tends to be a dog who has his own thoughts about who he wants and doesn’t want to meet. We asked him to be nice to everybody — people and dogs — and promised to make sure everyone was nice to him. Leaf wagged his tail with enthusiasm, when those who had read A DOG NAMED LEAF came over to admire him. 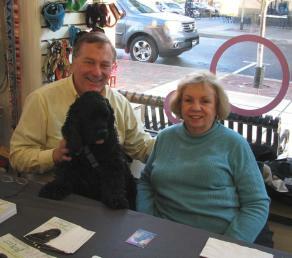 We wondered if he is becoming accustomed to his new role as a doggy celebrity. He was a real trouper all day and slept soundly for hours after we came home. The three of us (Leaf, Linda, and Allen) spoke onstage to the crowd. Leaf stood in the middle, receiving sliced apples (his favorite treat). At one point, we all seemed to be looking at someone in the audience with our heads pointed in the same direction. Visit http://www.angelanimals.net/nlimage108.html to view photos of the event featuring Allen, Linda, and Leaf Anderson. A big-hearted and undeniably appealing memoir about a man and his dog. 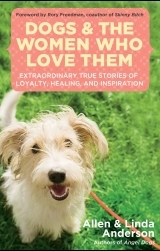 After authoring fourteen successful books that tell other people’s stories about the human-animal bond, Allen Anderson is ready to tell his own story – a remarkable journey with a highly intuitive but troubled, rescued cocker spaniel who literally saved Allen’s life. Allen, a former police officer who became with his wife Linda, an award-winning animal book author, received shocking news. Although only in his mid-fifties, he had two potentially fatal health issues – a brain aneurysm, which could rupture at any time, and a blood clot aimed at his heart. Leaf, his newly adopted canine family member, proved that at some level he understood and wanted to help with the dire situation. 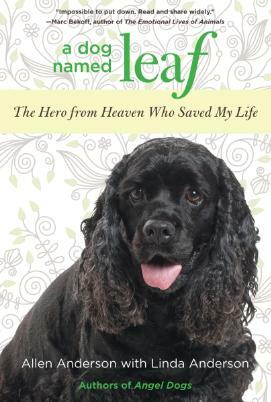 A Dog Named Leaf: The Hero from Heaven Who Saved My Life includes a strange but true example of animal cognition that leaves readers pondering, “What do dogs really know?” Leaf’s empathy went far beyond what scientists believe dogs are capable of knowing and doing. The audiobook takes readers on a dual journey of healing and trust for Allen and Leaf in three segments: The Journey of Two Souls Begins; Nightmares, Battles, and Surrender; Uncertain Outcomes: and Transformation and Healing.